Date: Saturday, 6 September. Venue: Scotstoun Stadium, Glasgow. Kick-off: 17:15 BST. Coverage: Live commentary on BBC Radio Scotland 810MW/DAB/online. 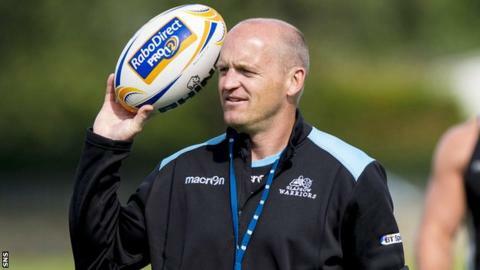 Head coach Gregor Townsend has urged his Glasgow Warriors players to go one better this season by winning the Pro12. The Warriors face defending champions Leinster at Scotstoun on Saturday night in a repeat of May's final. "That's our goal [winning the league]," said Townsend. "What we have to do is be better in every area. "If we do get to a situation when we're in semi-finals or finals, we have to make the most of that and win them." Townsend insists last season's 34-12 defeat in the showpiece at RDS Arena is now out of the players' system. "Things move on very quickly," said Townsend. "The focus comes back to that final a little bit because we've got the same opponents in our first game of the season." And the head coach is pleased to have the experience of prop Euan Murray in his side after the Scotland international returned to the Warriors following spells in England and France. Murray's international team-mates Ruaridh Jackson and Chris Cusiter left Glasgow this summer but Townsend is satisfied he has the required depth of squad. "When you're looking at the first team of the season, you're looking for the players that are in the best physical condition, those that have hit form quicker," he added. "Euan has been excellent since he's got here. He's trained really well. It's great having him around because he's such a help to the other players in his position and the comments he brings in. "We were delighted with the squad that we had. We're delighted that most of the players re-signed. We've got a strong squad, we've got depth in every position. "We feel we have enough cover, enough quality cover, to see us throughout the season and to make those that are playing play at a higher level just to keep their jersey." Meanwhile, Rob Harley, who makes his 100th appearance for Glasgow on Saturday, revealed Glasgow have adopted a new training technique similar to the '10,000 hours' system used by athletes. "Each player has to achieve 10,000 touches over the course of the season," explained Scotland cap Harley. "In training and competitive matches. It's to make us better players which will help us with out goals this season."